After seeing *widely disliked recent game* I thought it would be an interesting creative challenge to make a game in that style. 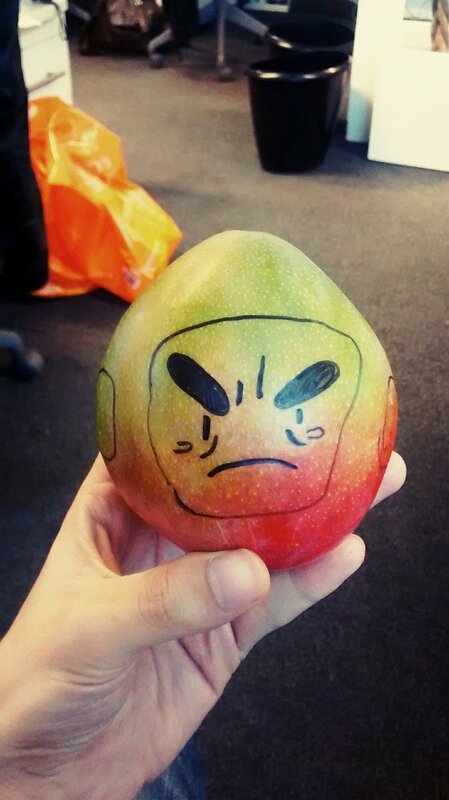 MangoMan is the result after about 3 weeks of work. You can jump and shoot. Includes 1 level, 1 boss battle and 2 difficulty settings. My name is Joseph Gribbin, and I'm an Independent Game Developer and Artist from London, England. If you like this game then please check out my other personal project The Wild XYZ. The music is by John Fio. Check his stuff out at audiosprite.com! Regarding Streaming, Let's Play's etc. : Go for it! Just link back to this page and possibly my twitter https://twitter.com/JoeGribbs if you can. I love it but controls are too tough! I love the Megaman Nes-Series so I played this little gem and I really enjoyed it! thank you Joseph! the mango aesthetics were nice, thank you ! A bit simple and the jumping felt heavy at first(drops like a Belmont), but I enjoyed this game overall. Would love to see what a full length version would be like. "We have to defeat the evil Salsa Army!" I played it till i got to the part with the blades on the walls. Too hard for me to survive so i gave up. I feel this game was too difficult for me. Some people like games to be difficult, but not really for me. How do you change the controles so that you can use a gamepad? Softlocked the game by having a disappearing platform reappear on top of me. verry good game made by one guy, ive tryed to make games in game maker, and its verry heavy to make something for your own, good job!, and i would recomend put arrow keys + z x, its more easy because the hands are sepatated, and there are a lot of games with those controls like Undertale, but it is your decision, GL. really into the look and level design. played a little slow. Hope you keep working on it! Worst keys ever for Keyboard! Why set such horrible keys? Can't even be reconfigured for custom keys. Why not use arrow keys for movement, z for jump and x for weapon like most games? Game makers need to setup some standard. As in Megaman but Mango and with a graphic design rosily sweetened.